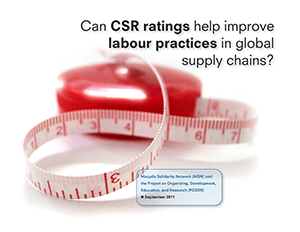 Can CSR ratings help improve labour practices in global supply chains? On March 1, 2011, some of the world’s largest apparel and footwear corporations announced the creation of a new Sustainable Apparel Coalition, an initiative to develop an industry-wide index that would measure and evaluate the environmental and social impacts of apparel and footwear products. The initiative promises to draw on the experience of other efforts to rate social and environmental performance to create a “single, open, industry-wide standard of measurement” of everything from water and energy use to greenhouse gas emissions, waste and labour practices. Although few details are available at present, the Coalition intends to release a pilot version of their index for comment later this year. goods, rating a company or a product on its environmental impacts is no easy matter. Rating a company’s or product’s social impacts – and more specifically, whether the company is respecting the rights of the workers who make the product – is even more complex. A publication of Project on Organizing, Development, Education, and Research (PODEr) and the Maquila Solidarity Network (MSN).